Regular readers of this blog will know how I feel about dogs. I love them. I mean, I really really really love them. They make me incredibly happy with their snuffling and padding, licking and pawing, stretching and bounding. Though I’ve been lucky to have lots of dogs in my life – Rosie, Rufus, Winston, Tammy and Mac – I haven’t had a dog of my own since I was a teenager. Pick him up on the first day of the summer holidays. Pick him up in 33 days, 22 hours and 18 minutes. Oh! I am so excited for you! This is wonderful, wonderful news! I’ll have to count down the days with you! Ooooohhh, how fabulous! 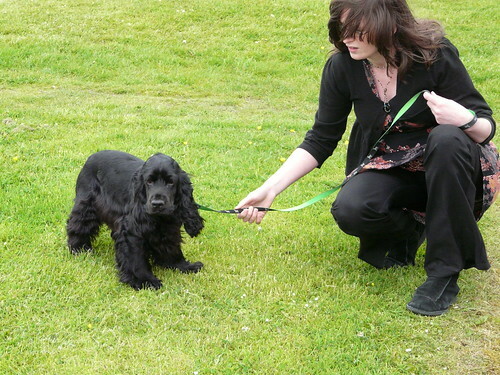 He’s a beauty too – we had a black spaniel when I was little. Does he have a name yet or have you got 33 days to decide? Can my girls (dogs) and I come to visit the new arrival? He’s sooooo cute… And they really like cute, little boy dogs… Big cows, that they are. Oh, adorable softie!! He is so cute I thought he was a she, sorry about that:) Congratulations, it must be totally exciting indeed! Gen – Can’t wait for them to meet! It’ll be hillarious. Pia – He is very pretty so I totally understand why you’d think he was a she. 🙂 And I’m sure he’d love to play with Malte too! The gorgeous dog’s name? We vote for Hamish. Douglas has unfortunate connotations in our family – although you would have to ask Andy the reason why! Oh little cutie! 😀 wonderful..i can understand yuo are impatient ! Really adorable! So very beautiful, I could cry. You’ve no idea how excited I am for you! v v v exciting news – I bet you will be spending the next 33 days looking over your house with new eyes about how dog friendly it is and where he will sleep and what to feed him and getting everything ready to welcome him. Will he be an inside dog (all my family’s dogs were outside dogs)? and have you thought up a name yet! Awwwww congratulations on your new companion Wendy!!!! I am totally green with envy here. Shona – Sounds intriguing! Will have to remember to ask Andy. Lucy – I knew you would be. He’s not only gorgeous but amazingly gentle and affectionate too. I just can’t stop smiling. Johanna – He’s one year old and already has a name. Unfortunately it has negative connotations for me. Apparently it will be fine to change his name since he’s moving to a new environment with a new owner. Possibilities are: Archie, Hamish or Douglas. Pat – Thank you! I’m terribly excited! gorgeous dog – love the idea of calling him hamish or archie! Awww, what a lovely looking doggy! Lucky you, I’d love a dog. He’s gorgeous! Rebus and Falco (both Cairn Terriers) think Archie, Hamish and Douglas are all good names; Rebus in particular thinks all dogs should have Scottish names, as he was named for Ian Rankin’s detective novel series. omg, he is adorable and what a sweetie. our dog was born on the first day of summer holidays 7 years ago! your summer hols will be great with him. our dog only spent a couple of weeks sleeping downstairs when we got her home, as soon as she was house trained, she got up stairs and has slept under our bed ever since. I could not be without her! Megan – Don’t worry, there will be LOTS of pictures! I want one! He is so cute. My cats may have something to say on the matter, sigh! Oh Wendy, I love dogs too and just like you haven’t had one since I was 14 years old. You’re truly lucky! Lore – I know. I really do. Aforkfullofspaghetti – I’m trying to run around a lot during the day. Tire myself out, you know? And you love cockers too? They are wonderful wee things. So bouncy and affectionate. Wendy, so lovely! I love black cockers, since when I was born, that’s the dog we had. Josie had a wonderful temperament, but frowned on little girls running in the house. You’re going to have so much fun with this little guy. Archie sounds right to me. Congratulations! Oh, I’m well chuffed for you – you must be soo excited! Looking forward to seeing more pics! Kittie – There will be plenty of photos. Trust me on that one! Oh how completely gorgeous!! I’ve been away – can’t believe I missed this exciting news! I am totally jealous and can’t wait to see more of your gorgeous pup!! Remember blondes have more fun!! Antonia – Nor can I!! !